The Motley Fool Canada » Bank Stocks » Will There Be a Canadian Housing Market Meltdown in 2019? There have been chatters about increased short interest in Canada’s banks. Those are just headlines to grab your attention. As you can see in the chart below, for most banks, the short interest isn’t nearly as high as in 2016, except for Canadian Imperial Bank of Commerce (TSX:CM)(NYSE:CM) and Laurentian Bank of Canada (TSX:LB). RY Short Interest data by YCharts. 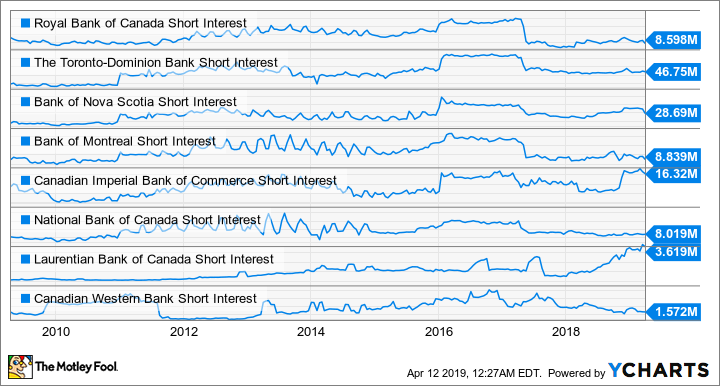 The 10-year short interest history in eight Canadian banks. There have been chatters about increased short interest in Canada’s banks. Those are just headlines to grab your attention. As you can see in the chart below, for most banks, the short interest isn’t nearly as high as in 2016, except for Canadian Imperial Bank of Commerce (TSX:CM)(NYSE:CM) and Laurentian Bank of Canada (TSX:LB). Since it’s costly to short stocks, it’s safer to assume that the shorts are onto something. So, investors should tread extra carefully around their positions in CIBC and Laurentian Bank. This may be why the shorts are after CIBC and Laurentian. CIBC is the most domestic bank among its Big Five peers. So, if there were to be a Canadian housing market meltdown, it will get the biggest hit among its peers. And Laurentian has its own slew of problems that it needs to recover from. Will there be a Canadian housing market meltdown? According to an economic study done by Royal Bank of Canada (TSX:RY)(NYSE:RY), single-detached homes are at their most unaffordable levels since going as far back as 1986 based on ownership costs as a percentage of median household income. The last time it was this unaffordable was in 1990 — 29 years ago! Exactly how unaffordable are Canada’s homes? Royal Bank found that at the end of 2018, across the country, 51.9% of income was needed to cover the costs of owning a home. As you probably anticipated, our home-owning friends in Vancouver and Toronto are in the direst situations. Vancourites needed 84.7% of household income to cover ownership costs, while Torontonians needed 66.1%. To put things in perspective, the Canada Mortgage and Housing Corporation, a Crown corporation, defines affordable housing as spending less than 30% of total household income on shelter. Lower housing sales and a recent drop in price have actually improved housing affordability, even though it’s ever so slightly — 0.7% in Q4 2018, according to Royal Bank. Compared to in 1990, this time around, it took longer for detached homes to get to this high an affordable level. Additionally, condos are typically a much more affordable option, and there continues to be developments of new condos to soak up the demand for housing. Moreover, there’s the safety net of mortgage default insurance that homebuyers must get if their down payment is less than 20% of their mortgages. In the case of a default, this pool of money will help protect the lenders. So, a Canadian housing market meltdown doesn’t look probable. Yes, buyers prefer detached homes over condos. And yes, detached homes have become ridiculously unaffordable, especially in Vancouver and Toronto. However, the housing market isn’t so bad right now that it looks like it’s going to melt down. There’s a cycle to everything. After a multiple-year run-up of housing prices since 2014, some drop in housing prices to more affordable levels may be inevitable. So, if you hold banks such as Royal Bank, Toronto-Dominion Bank (TSX:TD)(NYSE:TD), Bank of Nova Scotia (TSX:BNS)(NYSE:BNS), or Bank of Montreal (TSX:BMO)(NYSE:BMO) that are diversified in the U.S. or elsewhere, there’s no need to panic and sell out of your positions unless they make up too big a piece of your portfolio. If anything, we might just see slower growth in these banks. They continue to have strong coverage for their dividends, and their operations will continue to chug along and generate multi-billion dollars of net income every year. Fool contributor Kay Ng owns shares of The Bank of Nova Scotia and The Toronto-Dominion Bank. Bank of Nova Scotia is a recommendation of Stock Advisor Canada.